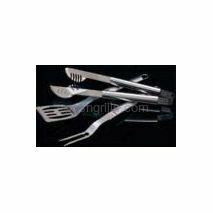 3 Piece All Stainless Steel BBQ Tool Set. Euro design. Includes spatula, fork and tongs. . Comes in Gift Box. 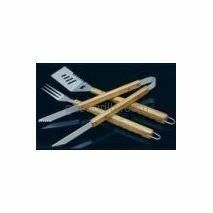 3 Piece Deluxe Stainless Steel BBQ Tool Set. All with thick wood handles and finger grips. 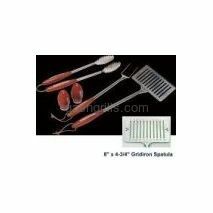 Includes 3 function spatula, 3 prong fork and tongs. Comes in Gift Box. 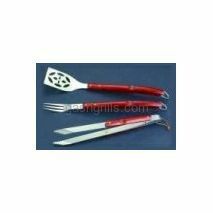 3 Piece Stainless Steel BBQ Tool Set with curved rosewood stained handles and finger grips. Includes spatula, and tongs. Comes in Gift Box. 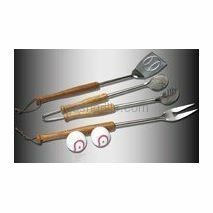 5 Piece Stainless Steel Baseball BBQ Tool Set. Includes stainless steel spatula, fork and tongs with baseball bat handles plus baseball salt and pepper shakers. Comes in Gift Box. 5 Piece Stainless Steel Football BBQ Tool Set. 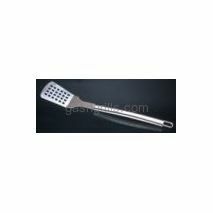 Includes stainless steel spatula with gridiron markings, fork and tongs with football grip grip handles plus football salt and pepper shakers. Comes in Gift Box. 5 Piece Stainless Steel Golf BBQ Tool Set. 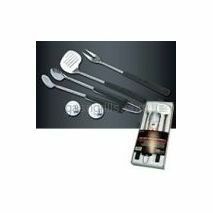 Includes stainless steel spatula, fork and tongs with golf club handles plus golf ball salt and pepper shakers. Comes in Gift Box. All Stainless Steel Fork .Extra long with ergonomically correct handle.21" Overall Length. 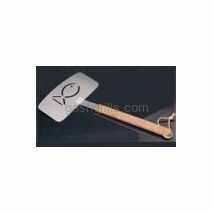 All Stainless Steel Spatula .Extra long with ergonomically correct handle.21" Overall Length. 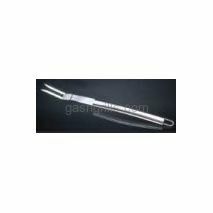 All Stainless Steel Tong .Extra long with ergonomically correct handle.21" Overall Length. Stainless steel with genuine rosewood handle Fork. 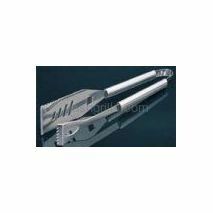 18-1/4" Overall Length. Stainless steel with genuine rosewood handle. 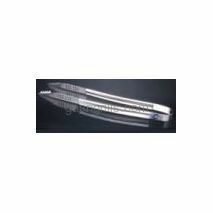 19" Overall Length. Stainless steel with genuine rosewood handle. 18-1/2" Overall Length. Stainless steel fish spatula with genuine rosewood handle.18-1/2" Overall Length.10" spatula width. Stainless steel multi function tool. Use as a spatula, tong, knife and bottle opener. 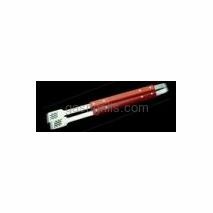 16-1/4" Overall Length .Comes in Gift Box.